Valuable when working with children administering a mat program or other floor activity. Mounted on 1.75" casters. 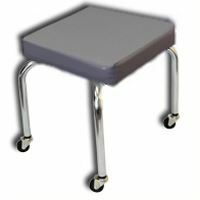 15 x 15” seat, foam padded top (2.5”), chrome plated tubular steel frame. 17.75” high. Grey.